Forget snowmen! My neighbors built igloos! We came home today and this is what we saw! We only drive through a small portion of our neighborhood to get to our house, but we saw at least 3 igloos. And the kids were no where in sight - this seemed to be a parental sport! Bman didn't build an igloo - his daddy's sick and he still has a small case of the sniffles, but he's 99.9% better. Don't forget to enter my giveaway! I'll be drawing a winner TOMORROW! Mr. B was quite happy. He's decided that food may not be the enemy and has enjoyed cheerios, yogurt, mac and cheese, chicken, puffs, and a host of other foods over the last couple of days. Chris and I went downstairs to watch a show I had recorded and Mr B busted out his break dancing skills. America's Next Dance Crew, watch out! This is his Vote For Me America! face. Anybody else excited to watch the Miss America pageant tonight? Me, me!! Have you missed my latest giveaway? Want to win a Faith Baby tee? Don't miss out on this great giveaway - it's ending soon! Snow and Food. Lots of both. I've taken a TON of pictures because, well, what else am I going to do while trapped inside? And MORE food...chili verde. Want this recipe? Go here. I think, in keeping with the food theme, that we might watch Julie and Julia tonight. It's STILL snowing and the weatherman said we could get about 8" by the time it's over. We went to my parents house last night in case of a power outage. I have been waiting to share this since we were at ACH on Brayden's birthday! We got to meet the Duggars! At the time we were there it wasn't out in the media that they had moved baby Josie to ACH, but I saw an interview they did this morning with People.com so I can share now! This is the hallway that runs right in front of the NICU entrance. We were standing there talking to B's nurse Sayward and she was just leaving to go to lunch when the Duggars walked out. I totally didn't see them, but Chris did and they started talking about Brayden! Once I realized what was going on, I joined in on the conversation. They said Josie is doing very well and when they thought she'd get to come home. They are such genuinely nice people! They asked all about Brayden and his NICU stay. Their primary doctor was our primary doctor, though we don't share any of the same nurses. They really (in my opinion) are at the very best hospital for little Josie. It's so much more than just a hospital. Everyone there truly cares about every single child and they don't just see them as a number on a bracelet. Anyway, I just wanted to share this, and I've been waiting until the info was out so that I could! I Want. I Want NOW. Mr. B has a new habit. Pointing. He doesn't point with one finger, but it's more of a whole hand jab. And if you don't give Mr. B what Mr. B wants in a timely fashion, he might just lose it. Totally. I thought that this wasn't supposed to begin until he was 2!! He does the whole kicking his feet screaming until he's red in the face thing. Now, just because Mr. B thinks that he simply must have my cell phone, glasses, glass of water, remote control or laptop, does not mean I give it to him - especially because 99% of the time we are at home and I can put up with the tantrums without, say, disrupting a bunch of people trying to eat their lunch or something. But I am a little worried that soon this behavior will transfer over to when we are out in public. He's a little too...well, little, to be truly disciplined and he thinks it is hilarious when I tell him no. How did you deal with the early forms of temper tantrums? Apparently, our weatherman might actually be on the right track this time...we might actually get ice and up to 12" of snow. I like it better when they are wrong. We heard today that houses in our town could be without power for up to a week. We may end up going to stay with my parents because they have a generator that can run their whole house. I hate this weather...seriously, one day it's nice outside, I can take B for a stroll and the next we're preparing for a blizzard. What is the deal? One good thing about nasty weather is B and I get to hang around in our sweats all day. I had a bunch of cute lounge outfits before B but sadly, they don't fit like they used to. Where do you get your favorite sweats? I am SO excited about this awesome review and giveaway! Don't you love the adorable onesie B is wearing? It's from Faith Baby! Faith Baby is such an awesome company. They offer a wide selection of onesies, tee's, bloomers and adorable headbands, and they have the greatest faith based slogans on them. Some of my personal favorites are "Mommy's Answered Prayers" and "It's Not Crying, I'm Praising the Lord!". I don't want to get all technical, but few know that my life before blogging and being a SAHM consisted of working in product development - designing baby clothes! 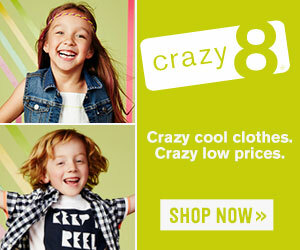 I can tell you first hand that the quality of these garments is excellent. B's onesie is printed on 100% cotton fabric that is incredibly soft and perfect for babies sensitive skin. As you might know, Brayden was our miracle after years of infertility - quite literally, our "Faith Baby." Faith Baby's onesies and other great products would be the perfect shower gift or perhaps a gift on baby dedication day! What's that?? You want a chance to win a Faith Baby onesie?? Well, ok! Go HERE to enter to win! First you guys cracked me up with your dislike for Vienna! I will say that even though I think she's okay, I don't really care much for any of the girls this season. It's turned into a who can be the craziest competition, which is sad because I think Jake really is a good guy! I have a giveaway hopefully coming TONIGHT - but it depends on how Mr. B feels! Hint, hint! Guesses?? I just realized I haven't blogged and some of you might think I've fallen off the face of the earth! A.) Did you watch the Bachelor? Who's your fave? Call me crazy, but I kinda like Vienna. B.) It's supposed to snow this week. Again. Sigh. Today Mr. B's cough went from dry to icky, so we took him to Wellquest...so glad they are open on the weekends! He has developed a little fluid behind his ears and has a slight wheeze so the doctor prescribed an antibiotic for him. She said over the next 3 or 4 days he should be back to himself! But I bet you've never seen a happier sick baby! He's still super smiley, laughs and plays, but he's very tired and not eating well. Hopefully soon he will feel 100%! Chris also got to change his very first (of many) diapers 366 days ago! Remember on Friday nights, coming home from school or work to get ready for TGIF Friday? Whatever happened to Friday Family nights? Where the whole family could sit down and watch TV that was appropriate for the entire family? 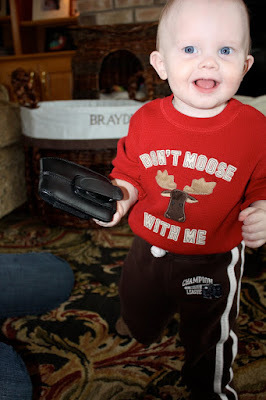 It makes me wonder what TV will be like when Brayden is older. My very favorite show growing up was (of course!) Full House. When I was little I called it The Michelle Show. I think I really thought that is what it was called! As I got older I really enjoyed Step By Step - remember that one? The opening had that big white roller coaster? I wish there was some sort of petition to bring back Thank Goodness It's Funny Friday's. Don't you? And, please be in prayer for The Little's. Their 4 month old is going in for a CT scan to check for possible tumors behind his eyes. You can visit them here for more information and to let them know you are praying. Thanks! Edited: Please be in prayer for The Little's. Their 4 month old is going in for a CT scan to check for possible tumors behind his eyes. You can visit them here for more information and to let them know you are praying. Thanks! The weather has been nice (er) this week (compared to snow and sleet) than its been in months but we haven't gone anywhere since Mister hasn't felt too well. I'm feeling a little stir crazy. Right now, I'd love to make a Starbucks run or a trip to Target or Wal-Mart. You know, because that's the kind of exciting stuff I like to do! Or I'd love to pull Brayden around in his wagon outside, or push him in his stroller or even strap him into his bike seat and take him on a bike ride. Or even out back so that he could ride around in his snazzy new car. I guess I will just have to wait until he wakes up to see how he is feeling. Where do you think we should go? First - THANK YOU to all of those who let me know where you are posting/reading from! Such a cool experience! I think I'm still a little shocked that you all care to read about us!! But thank you for doing it! I have a B update. Kinda. B isn't feeling well, which perhaps is part of the sippy/bottle/milk/soy/formula issue. He doesn't have a temp, but he has a clear runny nose and just has no energy. Remember my post on our schedule? Well that's been out the window. All he wants to do is sleep. He had his shots on the day of his 1 year doctor appointment and the next day he developed the runny nose. Oh and his extreme need for sleep. When he's awake he only wants to be held. At night he's been sleeping from about 7pm - 8am. BUT, we were able to try out a few suggestions. I think I'm going to wait until he is feeling 100% to really decide what he likes and what to do. Several of you suggested filling his sippy with water and adding a splash of milk, and then for his bottles that have the soy milk adding instant breakfast for calories and taste. We're doing both of those right now, so THANK YOU! If you have any other suggestions, keep em' coming! I promised a post on where I got some of B's decorations for his birthday, and this is that post! But first, I've got to say something. I'm now officially hooked on my Site Meter world map feature. Do you all use Site Meter? If you do, there's a link on the left that will show you where in the world your last 100 visitors are visiting from. Two days ago, I clicked on it and in my last 100 were people from Norway, Brazil, Australia, Italy, France, Germany, Malaysia, Hong Kong, Toyko and New Zealand. Do what?! I had no idea anyone outside of the U.S. read my blog, and I'm still shocked that anyone other than family would even want to read it! Ha! But thank you for reading! And if you are in one of those countries, leave me a comment! That's just beyond cool to me! OK, on to what y'all were wanting to know! My mom, grandma and I made the pom poms one afternoon - they couldn't be easier or cheaper to make. We made them to hang on the chandelier and also, for the fireplace mantle. I also bought a bunch of red and white striped ribbon and blue and white polka dot ribbon and laced it around. The fabric on the table is also from Hobby Lobby - half off! Amy, from Amy's Party Couture made the beautiful birthday banner. You can visit her here. She also made these cupcake toppers for me, that went perfectly with our theme. The striped ones say "Oh what fun, Brayden is ONE!". My mom, grandma and I also made B's monogram. We used pre-cut letters and I bought some scrapbooking paper when it was half off at Hobby Lobby. We traced the letters and glued the paper to them. B's tee came from Little House Tees. She did a great job! It matched the cupcake toppers which is what I wanted, and it had our birthday slogan (Oh what fun, Brayden is ONE) on it. Another do it yourself project. This is more of the scrapbooking paper that I got on sale. I just cut it out about an inch bigger than the picture on all sides (Dad actually helped me with this one!) and then glued the pictures on. Then, I secured them to some yellow ribbon and hung them on our french doors. 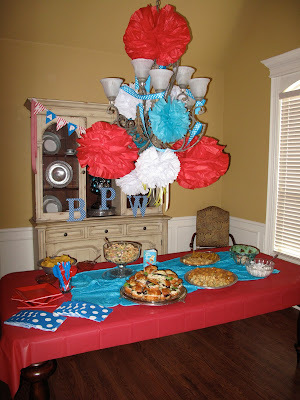 I hope that answered your questions and maybe gave you a little inspiration for your next party! A lot of these ideas are great to do on a budget because they just don't cost that much! Plus, if you have a Hobby Lobby nearby, you can get a lot of the things you need half off - I bought the paper, ribbon, fabric and some other items all half off! I'm So Excited. And B Can't Hide It. B had taken 7 steps on 1-17-09. Last night, the 19th, he decided he was ready! He took 7, then 8, then 8 again, then 13 twice, then he started taking over 20 steps! So Chris ran to get the camera! He wanted my bracelet - that was the bribe! Ha! He loves to try and take my bracelet off so that he can chew it. Weird, but true. Then he spotted the other camera on the floor and forget it! He had his sights set! Yesterday we started Brayden's new eating plan. Ha, that makes it sound like he's on a diet which is totally the opposite of what we are doing! He just hates the baby food snacks...even the graduate ones. He either wants real food, that he sees me eating or nothing. He is also getting his new milk, Lactaid. So far, he hates it! I'm not really sure what to do. He's used a sippy cup for months now - at least 6 months, maybe more. So he understands it he just doesn't want anything other than water in it. He will hold it and pretend to drink from it but then he spits it ALL OVER! But he stills loves his goldfish. I'm sure that it's not because he sees me eating them with him! Nope, that couldn't be it! Today, Brayden's new wall letters showed up! Don't they look great? I found a site on Etsy called Whimsical Rooms and she hand-painted these letters to go with his Dr. Seuss themed room. I need to do a whole other post on where I got B's birthday stuff off of Etsy! Maybe I will have some time later! We had B's one year well baby visit today! He is still at 50% for height and less than 5th for weight. 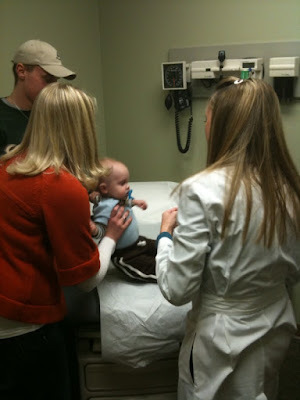 Our pediatrician said there is nothing wrong with him and he is just a tall, skinny boy! My brother and I were exactly the same way - actually I think Jeff was 100 percentile for height and like, 0 for weight! I guess that is just how our family is! Anyway, our doctor gave us the go ahead to either switch him to soy milk or toddler soy formula. We decided to try Lactaid soy milk first (we went with that brand because it had the highest calorie count - which is still less calories per ounce than what we mix his formula to). He also suggested moving B to just a cup! Ahh! So, I asked if we could keep him on his night time bottle because I'm scared of what will happen if I take that bottle away...I'm guessing a total freak out! Moms...any advice? How did your kids take to the transition of cup to bottle and formula to milk? We are going to continue to watch his weight - we weigh him before every bath and always have. If there is a significant decrease we will probably switch back to the bottle for now, and possibly put him on toddler formula so that I can control his calories. 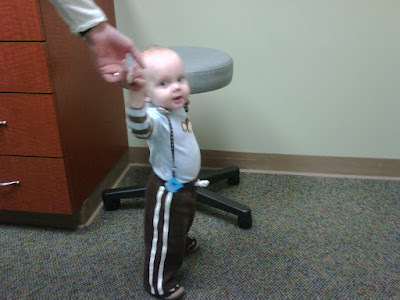 The doctor gave me the best compliment a mom can get - that I'm doing a great job with him! That made me so happy! We put Brayden in the church nursery for the first time. I know you probably think I'm crazy for not putting him in there until now, but I didn't want him to get sick. He was considered as having a compromised immune system because of the PPHN (even though it's gone) and I didn't want him to be another baby returning to the hospital with RSV or something. But, now it's time. He doesn't want to sit through church - he wants to preach the sermon. And as nice as our pastor is, I don't think he would want to give up the pulpit to a one year old! He was waving bye bye at me. He did really well - or so they tell me! When we left to get him, a security team member was carrying him around. He had gotten a little overwhelmed by the screaming! Ha! And on an un-related note...my MIL and step FIL were driving home last night and they hit a llama. A llama. In Arkansas. They are fine but their car got pretty damaged (I mean, it was a llama!). I just had to share that because, how often do you see llamas crossing the freeway?! Today was B's very first birthday party! We had a small family party with just my parents, brother, grandma and Chris' mom, stepdad, dad, stepmom, brother and step sister. Whew. I ordered B a smash cake of the hat from Cat in the Hat. Well, it came out a little ... large! It was tasty though! Red velvet cupcakes adorned with red icing and white cake cupcakes dyed blue, with blue icing. The mantle - those are Chris' Dr. Seuss books from when he was little. His mom Lori gave them to us recently and they were perfect! When B woke up from his nap, Chris and I went to get him and put him in his birthday outfit. His shirt says "B" with Brayden written across it, and the circle around it says "Oh what fun, Brayden is ONE!" We were singing happy birthday to him. He couldn't quite figure out what was going on! Since the cake was too big to give him, I cut off the top layer and let him at it! Family pic! He was laughing hysterically at me! I am exhausted! It was SO much fun, and we all had such a great time! More later, I'm sure!